Join as an Ambassador for African American Art or make a gift to the fund to help grow the collection with works by African American artists. Museum purchase with funds provided by Jorge M. Pérez, the John S. and James L. Knight Foundation and the PAMM Ambassadors for African American Art. 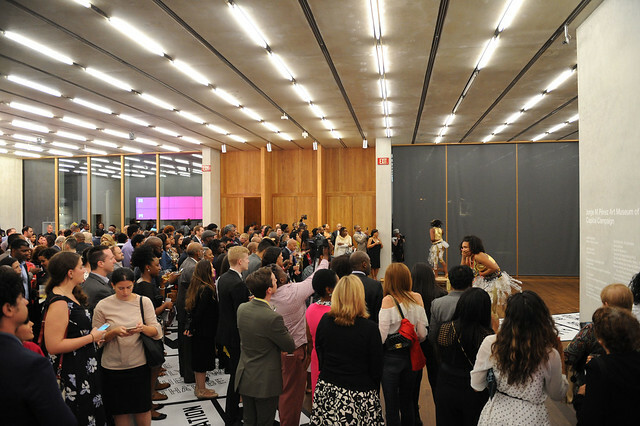 ​The PAMM Fund for African American Art was initiated with a $1 million grant, funded equally by Jorge M. Pérez and the John S. and James L. Knight Foundation, for the purchase of contemporary art by African American artists for the museum’s permanent collection. Through the fund, the museum first acquired works by Al Loving, Faith Ringgold and Xaviera Simmons. These pieces joined other significant PAMM collection objects by artists such as Leonardo Drew, Sam Gilliam, Rashid Johnson, Lorna Simpson, James Van Der Zee, Carrie Mae Weems, Kehinde Wiley and Purvis Young. Join Pérez Art Museum Miami as an Ambassador for African American Art, and your participation will help PAMM acquire and exhibit major works by African American artists for years to come. Support the Fund with a donation of $250 or more. Enjoy Dual museum membership including free admission for 12 months and 10 percent discount at the PAMM Shop and the waterfront Verde Restaurant. You will receive invitations to quarterly Ambassadors' events and name recognition in PAMM’s e-newsletter and on PAMM’s website. Make a contribution of $1,000 or more and you will also receive a complimentary invitation for two to PAMM's official Miami Art Week/Art Basel celebration, plus select talks and tours with art connoisseurs and curators throughout the year. Initial funding for the PAMM Fund for African American Art was provided through the generosity of the John S. and James L. Knight Foundation and Jorge M. Pérez.